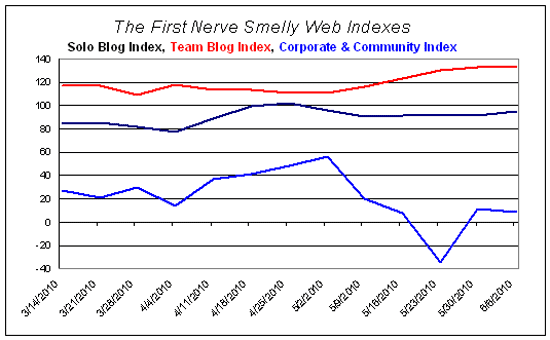 There was not much movement in the Corporate & Community Site Index this week. TheDryDown plunged 30% in the week ending May 23, but climbed right back 30% on May 30, pulling the CCSI out of negative territory. This week TheDryDown was off only 2%. The only big mover on the Team Blog Index was ISmellThereforeIAm, which was up 5% following a 2% gain last week. 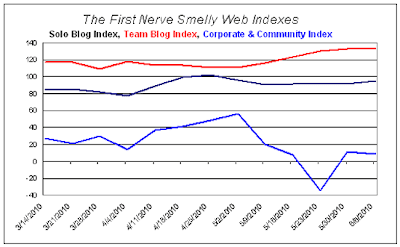 The Solo Blog Index was steady the past two weeks. AnyasGarden rose 19% following a 5% gain last week; FirstNerve continued to slip after several weeks of light posting. PinkManhattan was down slightly after falling 15% the previous week; overall the site is down 20% in two weeks.